Mercedes-Benz South Africa honors the legacy of Nelson Mandela by producing an emotional video, 100 years after his birth. The two-minute film depicts the life of the legendary fighter for freedom and a short story on the Mercedes that was gifted to him soon after his release. “Paying tribute to his legacy that defined a country, Mercedes-Benz South Africa are sharing a 2-minute video highlighting the special moments and ties the company has had with Nelson Mandela”, say the local representatives of the company. The video starts the story with the 11th of February 1990, the day that Nelson Mandela was released from prison, at 4:14 pm exactly, after 27 years of imprisonment. The people avalanched onto the streets to celebrate. At the same time, a car was being built for him. Nicknamed “Madiba’s Merc”, it was actually, more than just a car. The red Benz with a V8 engine was a special version of the W126 S-Class, hand-built at the plant in East London, outside the normal working hours. The workers did not request extra payment for the extra time on the job and the parts were donated by the management. Old footages show workers singing and dancing around the car while working. All of them wanted to be a part of the project. The special project was completed in four days only. The personalized nameplate read “999 NRM”, standing for Nelson Rolihlala Mandela. 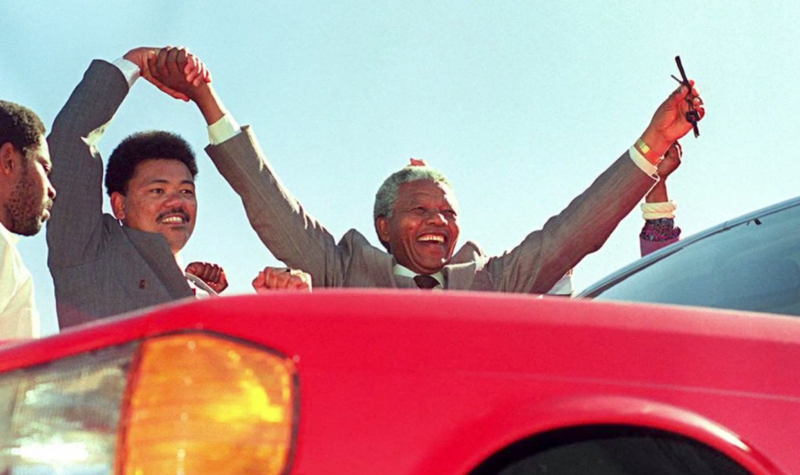 When he received the bright red W126 S-Class, Mandela said that the color would always remind him of the blood spilled by the South Africans in their struggle to put an end the Apartheid system. The red sedan is now on display at the Apartheid Museum in Johannesburg.